The definition of the "desktop" is changing. The workforce is increasingly mobile, and there is a plethora of choices - tablets, smartphones, thin/zero clients, client hypervisors, virtual desktops, hosted applications, cloud-based services - available now with even more options coming. The term 'desktop' is becoming a metaphor for the collective devices, applications, services and content to which users subscribe both within the enterprise and in the cloud. 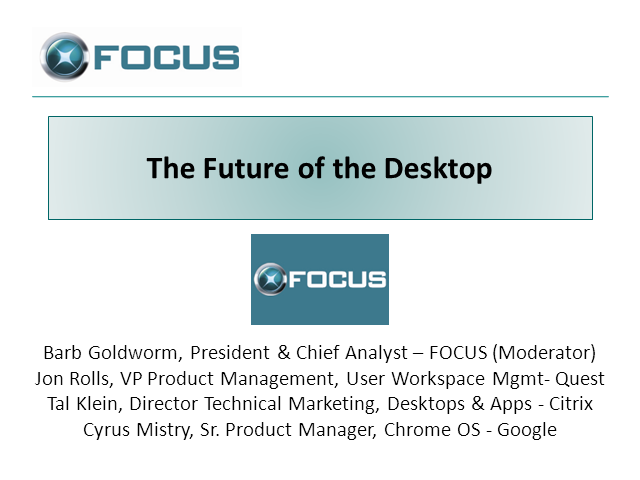 Attend this roundtable webinar led by analyst Barb Goldworm as she and a panel of industry visionaries discuss the desktop of the future and the future of the desktop, and how you should prepare your infrastructure for what's next.